Well that was an entertaining evening, hope you enjoyed reading about it (or second screening with us - I know all the jargon). Plenty of other football to read about on the BBC Sport website tonight. Lots of League Cup shocks including Oxford's 4-0 rout of Championship Brentford. If Dundee derbies are your thing, that ended 2-2 thanks to an injury-time equaliser. You can also read the full report on this amazing game, and Pedro's transfer request. It's all just one click away. Barcelona's technical secretary Roberto Fernandez has confirmed that Pedro wants to leave the club. The 28-year-old Spain forward, who has spent his whole career at Barca, is a reported target of Manchester United. He is thought to have a release clause of about £22m. Fernandez told Esport 3: "Pedro has told me he wants to go. The buy-out clause in Pedro's contract is not negotiable but this could be his final game." Super-champions of Europe? Not sure that's a thing, Barca. No time for Barcelona to celebrate this one too much though. On Friday they face Athletic Bilbao in the Spanish Super Cup first leg (second leg is on Monday). Can they win two trophies in the first week of their season? You'd fancy their chances. I think I've seen Arda Turan there celebrating with his new team-mates. The summer signing from Atletico Madrid can't play until January because of a transfer ban. I presume he won't get a medal either. But not a bad start to life as a club employee. Gerard Pique brings the trophy down the stairs as Barcelona continue their celebrations on the pitch and pose for photographs. I hope they have recycling bins in Tbilisi for that ticker tape. It was everywhere. This will be Andres Iniesta's first trophy as permanent captain after Xavi left following over a decade of lifting silverware. Uefa boss Michel Platini hands the trophy to the midfielder and the party can begin. Barcelona's players go up to collect their medals and lift the trophy. Luis Enrique has won four cups in just over a year as Barcelona boss. Barcelona are in the running for six trophies this season. The Uefa Super Cup, the Spanish Super Cup (which they play in the next week against Athletic Bilbao), the Club World Cup and then the big three which they won last season. I saw quotes from Luis Enrique saying they were hoping to win all six. That dream almost ended before it started today. They make all the Sevilla players walk past the trophy, which seems a bit mean. But there you go. Barcelona's players give their Sevilla counterparts a guard of honour as they go up to collect their runners-up medals. Tonight was Pedro's second Uefa Super Cup goal. Both came in the 115th minute and both were winning goals. The other was against Shakhtar Donetsk in 2009. A few records from that game. Barcelona are now the joint most successful Super Cup team ever - they have won five tournaments, the same as AC Milan. Dani Alves has now won four (one with Sevilla), level with Milan legend Paolo Maldini. And that was the highest scoring Super Cup match ever. That game was almost inappropriately good. Barcelona led 4-1 and threw it away. They go 5-4 up in extra time and Sevilla miss an open goal to make it 5-5 and go to penalties. That brings to an end one of the greatest games of football I have ever seen. OH MY WORD. The free-kick is played to Ciro Immobile who squares it to Adil Rami and the defender blazes over an empty gaping goal from two yards out. A sitter. Free-kick to Sevilla - everyone goes up. Sevilla get the ball and break and Mariano is in the box but he's denied by a wonderful tackle from Jeremy Mathieu. That was match-saving by the Frenchman. Luis Suarez takes it to the corner. Michael Krohn-Dehli and Dani Alves are both booked for their roles in that melee. A minute to go. A huge bust-up between both sets of players. I'm not sure what's happened here. It should be 5-5. Ever Banega picks out Coke with his free-kick, but the defender - in a lot of space in the penalty box - heads it just wide. Agonising. Apparently that was Pedro's 99th goal for Barcelona. This could be his final appearance if he has put in a transfer request as reports suggest. Three minutes left to get his 100th. Sevilla go straight down the other end and Yevhen Konoplyanka tries to find Vitolo but a Barcelona defender just about intercepts it. This has been a game for the ages. Surely this is the winner. Lionel Messi's free-kick hits the wall and comes back to him, he shoots again but it's saved by Beto with Pedro turning it in from close range. Free-kick in Lionel Messi territory. Mariano brings down the Argentina on the edge of the D.
It's like a training game - I think there must be 21 players in Sevilla's half now. It's attack v defence. Lionel Messi goes on a dribble, Adil Rami tackles him and wins the ball but it's a free-kick. It was a double footer. It's not shooting distance though, and Barca win a corner from Coke's head. It mightn't surprise you to know this is the highest scoring Super Cup game ever. Barcelona forward Lionel Messi tries a bicycle kick from 12 yards but it's well over. That would have capped off a phenomenal game. Sevilla have all 11 players behind the ball as Barcelona try to find a way through. Sevilla striker Ciro Immobile, who has been anything but since coming on, causes Barcelona early pressure but Gerard Pique does enough to stop him in the box. Second half of extra time under way. It's 1am in Georgia now. I asked if any of you have attended sports games this late. Sevilla have the final chance of the half as Mariano's shot is easily held by keeper Marc-Andre ter Stegen. Ninty seconds to the break. Barcelona are trying to get the ball into the box but fail and Ciro Immobile helps pressure Barca all the way back to keeper Marc-Andre ter Stegen. Brilliant chasing by the Sevilla substitute. This game will go on past 1am in Georgia. Have any of our readers ever been to a sporting event that's gone on later? Dani Alves tries to pass to Lionel Messi but it's a tired attempt and it's too far from the Argentine, who was only a few yards away from him. I think this is going to go to penalties. Seems like a year ago that Barcelona were rampant and we wondered how many goals they were going to score. Thought a Lionel Messi hat-trick was inevitable. Gerard Pique is livid and screams at the referee that there are six officials and none of them saw the clash. He's using naughty words in the English language - the officials are all British and Irish tonight. Gerard Pique got an elbow to the face from Ciro Immobile (who has already been booked). Blood is pouring from the defender's nose, he's furious. Replays show the contact looked accidental. Pedro has been on the pitch about 10 seconds and he's been booked for a foul by Vitolo. This is interesting. Forward Pedro comes on for midfielder Javier Mascherano. We just heard a few minutes ago he's asked to leave the club. Will this be his final game? Will he be the hero? A corner for Barcelona but Marc Bartra - who could have done better for Sevilla's equaliser - heads over. Sevilla substitute Ciro Immobile is booked for a foul on Javier Mascherano. BT Sport reporting that Pedro - who is on Barcelona's bench - has asked to leave the club. Manchester United want the 28-year-old. We are under way in extra time. I was meant to be writing League Cup reports now! It's gone half past midnight in Tbilisi by the way. I can see a lot of people calling in sick for work in the Georgian capital tomorrow. Lionel Messi fires straight into the wall. And the 90 minutes are over. To extra time we go. Lionel Messi steps up to take the free-kick. The last action of the game surely. Free-kick to Sevilla, coach Unai Emery urges his players forward. The free-kick comes to nothing and Barcelona break. Ever Banega takes one for the team and he brings down Luis Suarez to end the threat. A hugely important foul. Three extra minutes. If no-one scores we get another 30. Yes he does, but it clips the outside of the post and goes wide. A wonderful free-kick when a lot of people were expecting a cross. Free-kick to Barcelona as Grzegorz Krychowiak fouls Lionel Messi. It's 30 yards out. Will Messi have a go? Sevilla defender Coke is booked for a slight shove on Luis Suarez. Seemed a bit harsh. Free-kick to Barcelona but it's punched clear by Beto. Two to go. Barcelona come forward, four minutes to score a winner. Sergi Roberto is inches away from heading home Dani Alves's cross but just can't quite get there. Barcelona throwing away a 4-1 lead - this is genuinely remarkable. It looked like they were going to rack up six or seven goals at one stage. A phenomenal effort from Sevilla. Half an hour ago at 4-1 I said: "I had wondered earlier if we'd have extra time tonight. If we do, we've seen something special in Tbilisi!" We definitely have seen something special here. Half an hour more of this? Yes please. Best game ever. Ciro Immobile, in his first touch as a Sevilla player, loses Marc Bartra and squares it to Yevhen Konoplyanka,who taps into an empty net for a debut goal. And here comes Ciro Immobile for his Sevilla debut. The Italy striker comes on for Kevin Gameiro. Ten to go. Oh and Mariano comes on for Vicente Iborra. It's also his debut. Are Barcelona worried? You bet they are. Frontman Rafinha comes off and he's replaced by centre-back Marc Bartra. Sevilla have a free-kick but Ever Banega, who scored earlier, clips it into the box instead of shooting. He finds Coke, whose cross is missed by striker Kevin Gameiro. That could have been 4-4. Barcelona are getting defender Marc Bartra ready to come on and help shore things up. Lionel Messi has a shot from 25 yards but it's kept out by Beto. This is a brilliant game now, end to end. Sevilla have Italy striker Ciro Immobile, on loan from Borussia Dortmund, on the bench. Surely we'll see him soon. One more Sevilla goal and we get extra time. Seventeen to go. Kevin Gameiro takes the kick, Marc-Andre ter Stegen guesses right but he's not able to keep it out. Huge moment, a cross comes in and Jeremy Mathieu drags Vitolo to the ground. A definite penalty. The defender is booked. Yevhen Konoplyanka (a copy and paste job if I'm being honest) had a go straight away but it fails to test Barcelona keeper Marc-Andre ter Stegen. Sevilla bring on winger Yevhen Konoplyanka for his debut. The free transfer from Dnipro was a former Liverpool target. Jose Antonio Reyes is the man who comes off. Booooo. The free-kick is about 35 yards out but Barcelona don't have a shot. Instead they play the ball backwards and end up conceding a free-kick. Actually I'm not sure if I remember a shot from a free-kick that wasn't a goal. Luis Suarez goes down under a crunching tackle from behind by Grzegorz Krychowiak. The Barcelona striker looks annoyed, but then again that is often the case. Barcelona aren't going to risk Andres Iniesta following his injury a couple of minutes ago - a good decision in my decision. The midfielder hands the captain's armband over to Lionel Messi and comes off for Sergi Roberto. Corner to Barcelona as Ivan Rakitic plays a one-two with Lionel Messi but the Croat's effort is blocked by a Sevilla defender (maybe by his arm). And from the corner Rafinha heads the ball off the crossbar. Andres Iniesta is getting treatment behind one of the goals but he hobbles away from his staff - he's surely wanting to get back on the pitch. And that he does indeed - he's on again. A bit silly to take a risk though if he's not 100%. Barcelona captain Andres Iniesta is down injured. This will be a worry for Luis Enrique. Vitolo crosses the ball to Jose Antonio Reyes, who fires home first time from about eight yards out. Sevilla haven't given up yet and debutant Michael Krohn-Dehli fires a shot wide from 25 yards. We'll see some subs from both sides soon surely? I had wondered earlier if we'd have extra time tonight. If we do, we've seen something special in Tbilisi! Horrific defending by Sevilla. Benoit Tremoulinas tries to play the ball across to Ever Banega but he gets it horribly wrong and it's straight at Sergio Busquets, who is able to slide the ball through to Luis Suarez and the Uruguayan slots it under Beto. We're on the verge of a rout here. Luis Suarez's shot from just outside the box is deflected, it loops up into the air and keeper Beto casually waits for it to drop into his hands under pressure from Rafinha. 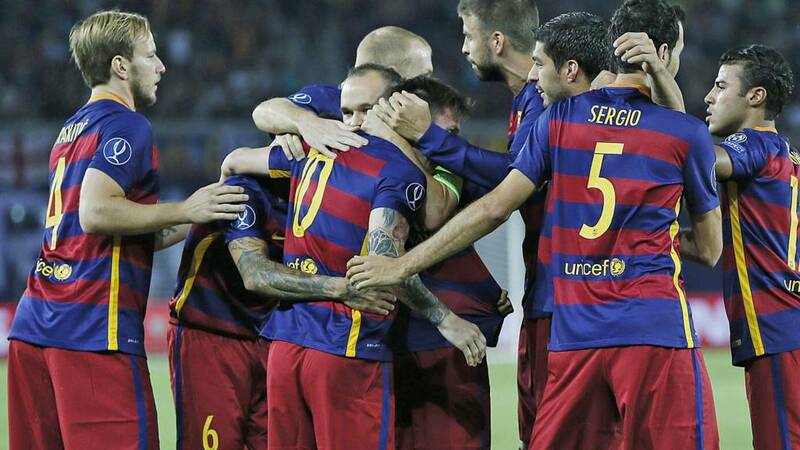 Barcelona will equal AC Milan's record of five Super Cup wins if they see this one through. The Catalans' four defeats in this curtain-raiser is also a record. Luis Suarez turns his defender from 25 yards with ease and half-volleys just wide of the post. Could be a long 45 minutes for Sevilla. Free-kick to Barcelona as Michael Krohn-Dehli brings down Lionel Messi. Luckily for Sevilla it's not in a shooting position though. Barca going forward already - a repeat of the first half. Barcelona get the second half under way. No changes by either side. Players are coming out for the second half now. You ready? Is Lionel Messi going to get a third? This is a good time to get a drink as I expect the second half to be quite intense again. Alternatively quickly check out our League Cup live text to see what shocks are on the cards. Barcelona had 66% of possession in that first half. They had eight shots to Sevilla's four and five on target to their opponents' two. Andres Iniesta plays in Luis Suarez, but keeper Beto gets there just before the Uruguayan can make it 4-1. And that's half-time. Barcelona in control. Luis Suarez should make it 3-1, he's in one-on-one but shoots straight at keeper Beto. He gets the ball back though, holds off midfielder Michael Krohn-Dehli and plays the ball to Rafinha, who slides home from close range under pressure from Coke. Sevilla almost equalise as Kevin Gameiro plays the ball to Vicente Iborra but Dani Alves is there to hack it off the line. It was almost an open goal. Sevilla have their first attack in a while but Gerard Pique punts it clear when Kevin Gameiro is in a shooting position. It was a proper hoof - good to see. It's all Barcelona, most of it going through Lionel Messi. Dani Alves crosses to Luis Suarez, who - instead of shooting - lays it off to Messi. The two-goal hero tries to play the ball back to the Uruguayan but it's cleared. Sevilla not getting a look-in at the moment. New Barcelona captain Andres Iniesta almost makes it 3-1 but his shot is blocked by defender Grzegorz Krychowiak. Lionel Messi was waiting to pounce if the threat wasn't cleared. Another Sevilla old boy has a go from about 25 yards - this time it's Ivan Rakitic but it's always curling wide. Barcelona in total control at the moment here, Sevilla need to be careful to not let the game go beyond them before the break. Right-back Dani Alves, once of Sevilla, has a go from distance that catches nearly everyone, including me, by surprise but luckily for Sevilla, keeper Beto was alert and it's straight at him really. The last three players to score two free-kicks in a Champions League or Europa League game? Luis Suarez (in his Liverpool days), Gareth Bale (when he was at Spurs) and Cristiano Ronaldo for Real Madrid. Not a bad bunch of players. Luis Suarez thinks he's scored for Barcelona but it's called back for offside. Lionel Messi has a hand in the move with some brilliant footwork in midfield to lose his marker, the ball gets played out to Jeremy Mathieu on the left for Barcelona and his cross is tapped into an empty net at the far post by Suarez. This is the first time in Lionel Messi's career that he's scored two free-kicks in a game. And there's still 65 minutes left for him to get his hat-trick. Sevilla have a spell of possession and defender Benoit Tremoulinas is feeling confident so has a go from 30 yards but it's straight at a Barcelona player. Lionel Messi plays the ball through to Rafinha, who has somehow found a pocket of space in the penalty area but his attempted pass to Luis Suarez is cut out by a Sevilla defender. The move comes to an end when Andres Iniesta's ball into the box is past everyone and out for a goal-kick. Sevilla break through Jose Antonio Reyes, who finds Benoit Tremoulinas, but his cross is deflected out for a corner by Gerard Pique's sliding tackle. The corner is crossed right into Marc-Andre ter Stegen's hands. Dare anybody put in a tackle now? Before kick-off we told you Lionel Messi had scored eight goals in his last five games against Sevilla. Make that 10 in six. And don't forget Sevilla are one of Spain's best teams. No way. It's a third free-kick! Lionel Messi has his second with a stunning effort from 25 yards. Beto is diving for it but it's beyond him and goes in off the post. Evar Banega fouls Ivan Rakitic and it's a free-kick in a dangerous position. Grzegorz Krychowiak is booked - he must have had a moan to the referee. Game just seems to have calmed down now after that frantic start. Andres Iniesta comes forward and finds Ivan Rakitic. It's about three minutes since anybody scored a free-kick. Nobody seems to dare putting in a tackle in a dangerous position at the moment. It's almost 2-1 to Barcelona. Ivan Rakitic's deep cross from the right is just beyond Rafinha, playing in place of Neymar. The Brazilian dives for the ball but just can't turn it in. Oh wow. Lionel Messi pops the free-kick into the top-right corner. Fantastic free-kick. What a start to the game! Two free-kicks within seven minutes. It's taking so long to take that the referee has to reapply the white line. Barcelona are doing most of the attacking now as they look for a way back into this game. And they have a free-kick right on the edge of the box as Lionel Messi finds Luis Suarez, who is brought down by Grzegorz Krychowiak. Ever Banega scores the resulting free-kick from 20 yards - goalkeeper Marc-Andre ter Stegen remained frozen to the squad. Brilliant free-kick - is a shock on the cards here? Sevilla have a free-kick just outside the box as Javier Mascherano fouled Jose Antonio Reyes in the build-up to that move. Marc-Andre ter Stegen looks OK after he was caught by Vitolo. Barcelona keeper Marc-Andre ter Stegen appears to be injured after Sevilla were allowed a chance following sloppy Barca defending. Sevilla get us under way in Georgia. I am not bothered by the label of favourites. The most important thing is to show on the field that you are better than your opponents. Sevilla will be a tough team to beat. Georgian children on the pitch are now signing John Lennon's Imagine. Let's just get on with the football. Both players coming out onto the pitch now. Barca captain Andres Iniesta (now skipper following Xavi's exit) brings out the Champions League trophy. Sevilla counterpart Jose Antonio Reyes, once of Arsenal, brings out the Europa League. Tonight's referee is Scot William Collum. "Without a doubt it's my biggest achievement. For a small country like Scotland to have a referee in the Super Cup is tremendous," he told Uefa's website. "It's fantastic. I'm delighted, really excited. I received the appointment about five weeks ago and ever since then it's felt like I've been dreaming. "Hopefully I can fade into the background. It's not always possible but it would be nice if that could happen." I've played in the centre of midfield before. If the coach decides that you should do something, then you do as you're told. I can play out wide, in the centre, wherever – especially when there's a trophy at stake. Even if I had to play in goal, you have to be ready to do anything. I'd clean up the pots and pans if I had to. Three of Barcelona's squad are former Sevilla players, although Adriano is only on the bench. Playing against Sevilla has become relatively normal now. It was my home. I grew up there as a footballer and as a person I will always be grateful to the city. Over time, though, the matches become less significant. This is not any old game for me. There is a lot of Sevilla in me, but not for this game. As I have always done, I’ll be giving everything I have to Barca. There has been some paper chat that today could be Pedro's last game for Barcelona (if he gets on the pitch), with Manchester United strongly linked to the Spain forward. But one Barca legend - who played under Louis van Gaal - does not think the 28-year-old should consider playing under the Dutchman. If he goes there he would no longer be a footballer. He is destroying all the players because he is so mediocre. Players have left because of him. He destroys clubs, he did it with Barcelona, and after they take years to build. Just heard a TV pundit suggest Pedro needs to leave Barcelona for Manchester United as he'll never get in the Barca team. He made 50 appearances last season, that's surely not too bad even if a lot of them were from the bench? This is the third ever all-Spanish Uefa Super Cup. Sevilla have been in all three, beating Barca in 2006 and losing last year to Real Madrid in Cardiff. This isn't the only football live text tonight. If the League Cup first round is your cup of tea, head over here. Or if the Dundee derby in the Scottish Premiership is for you, check out this link. As ever, we'd like your input. Barcelona haven't strengthened too much this summer but then they didn't really have to as last season's Treble winners. Can anyone match the European and Spanish champions this season, or are we in for another year of Catalan dominance? Let us know on Twitter using the hashtag #bbceurofooty, text us on 81111 (UK only and let us know your name) or on the BBC Sport or Match of the Day Facebook pages. Why isn't this in Monaco? The Super Cup used to be held in Monaco every season but now it moves around. Last season it was at the Cardiff City Stadium. This year? The Boris Paichadze Dinamo Arena in Tbilisi, Georgia. Paichadze was a Dinamo Tbilisi player whose career peaked in the 1940s in case you didn't know. For those of you who aren't overly familiar with Georgia, the former Soviet state is at the crossroads where Europe meets Asia. Read more about it on our country guide if you so wish. Barcelona forward Neymar is out with mumps as we already knew. Rather than Manchester United target Pedro, it's Rafinha who replaces his fellow Brazilian. Lionel Messi and Luis Suarez start as you would imagine. Sevilla only start two of their eight summer signings, defender Adil Rami and midfielder Michael Krohn-Dehli. Four of their subs are potential debutants. Barcelona: Ter Stegen, Alves, Pique, Mascherano, Mathieu, Busquets, Iniesta, Rakitic, Rafinha, Messi, Suarez. Subs: Bravo, Pedro, Bartra, Sandro, Munir, Sergi Roberto, Adriano. Sevilla: Beto, Coke, Rami, Krychowiak, Tremoulinas, Banega, Krohn-Dehli, Iborra, Reyes, Vitolo, Gameiro. Subs: Rico, Immobile, Kakuta, Luismi, Suarez, Konoplyanka, Mariano. A Barcelona side containing Lionel Messi as well as several of the world's other top players - the defending European champions are the envy of every other club side on earth. A Sevilla side featuring several talented footballers but a fair way off football's elite clubs with a highly rated manager hopeful of causing a Europa League shock. In 2006, Juande Ramos's side stunned Frank Rijkaard's Barcelona 3-0 in Monaco. Can Unai Emery's 2015 batch repeat the trick tonight in Tbilisi?